On NBC’s Meet the Press on Sunday, Rep. Marcia Fudge (D-OH) said that the George Zimmerman case was just evidence of a broader racial problem in the United States. “We are being attacked from so many sides that you have to at some point decide where you can have the most impact,” she stated. 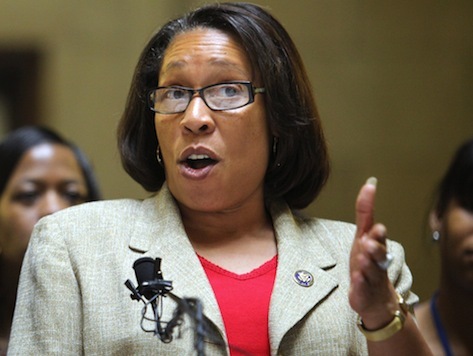 Fudge, who chairs the Congressional Black Caucus, stated that she wanted “a broader discussion that we need to have [about] how we are treating and minority people in this country.” She cited as evidence of racial discrimination the recent Supreme Court decision to change the baseline legal standard used to evaluate discrimination in voting from standards set fifty years ago, saying the decision “gutted” the Voting Rights Act. She also said that removing food stamps from the House farm bill was evidence of mistreatment of the poor and minorities.